Refrigeration, and Air Conditioning Engineers, to standardize and simplify air filter efficiency ratings for the public. 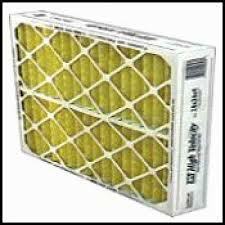 The higher the MERV rating, the more effective the air filter. Simply stated, a MERV 13 filter will remove larger amounts of small particles from the air than a MERV 4 filter. ASHRAE Standard 52.2-2007 shows MERV 13 & above are the appropriate application in general surgery, hospitals, and health care facilities. Pre Pleat M13 pleated panel filters are the ideal choice to achieve the minimum efficiency requirements of LEED® Green Building design. The low initial resistance of the M13 can also contribute an overall strategy of reducing energy consumption. Its one-inch, two-inch or four-inch depth makes MERV 13 upgrades as trouble-free as a direct replacement for most commercial and industrial applications. 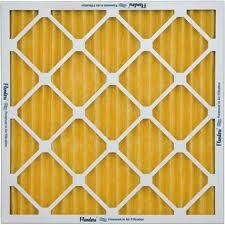 The VP-MERV 8 Pleated filter achieves MERV 8 efficiency with low resistance to airflow per ASHRAE 52.2-2007. Its filtering medium does not rely on electrostatic charge to capture particulate which will dissipate over time and during use. Our newest pleated filter, the VP-MERV 8 is an environmentally friendlier filter than the conventional beverage board framed filter. It uses 20% fewer fibers; fewer fibers equal real savings and supports environmental source reduction programs. Flanders Pre Pleat HT filters are designed for increased air filtration efficiencies in an operating environment where temperatures reach 400 degrees Fahrenheit. Typical examples include air intakes for drying ovens or high temperature baking applications. The Pre Pleat HV pleated filter from Flanders Precisionaire is designed to operate in high velocity and turbulent air applications where standard pleated filters have a tendency to fail. They are ideal for gas turbine and rotary machinery equipment or any area requiring a pleated filter to operate under demanding use. PrePleat HV filters are offered in the most popular face sizes in 2” and 4” depths. Pre Pleat 62RM11 pleated panel filter enables a significant upgrade in collection efficiency over existing MERV 8 products at the same resistance levels. A 25-30% average efficiency filter can be upgraded to 60-65% efficiency at roughly the same resistance levels.